What is wrong with the Novus Ordo Missae? A criticism of the New Rite cannot be a criticism of the Mass in itself, for this is the very sacrifice of Our Lord bequeathed to His Church, but it is an examination, whether it is a fit rite for embodying and enacting this august Sacrifice. It is difficult for those who have known nothing other than the Novus Ordo Missae to understand of what they have been deprived, and attending a “Latin Mass” often just seems alien. To see clearly what it is all about, it is necessary to have a clear understanding of the defined truths of our Faith on the Mass (principles 11-18 are some of them). Only in the light of these can the “new rite” of Mass be evaluated. B. What is the Novus Ordo Missae? communion under both kinds and in the hand, etc. a meal (vs. principle 11). This is shown by its use of a table around which the people of God gather to offer bread and wine (vs. principle 18) and to communicate from rather common-place utensils, often under both kinds (vs. principle 15), and usually in the hand (vs. principle 16). (Note too the almost complete deletion of references to sacrifice). a narrative of a past event (vs. principle 12). This told out loud by the one presiding (vs. principle 14), who recounts Our Lord’s words as read in Scripture (rather than pronouncing a sacramental formula) and who makes no pause until he has shown the Host to the people. a community gathering, (vs. principle 13). Christ is perhaps considered to be morally present but ignored in his Sacramental Presence (vs. principles 16 & 17). the celebrant facing the people from where the tabernacle was formerly kept. sacred vessels are no longer gilt. the priest no longer joins thumb and forefinger after the consecration. the vessels are not purified as they used to be. Communion is most frequently given in the hand. genuflections on the part of the priest and kneeling on the part of the faithful are much reduced. What is the aim of the Novus Ordo Missae as a rite? *Jean Guitton on December 19, 1993 in Apropos (17), p. 8ff, also in Christian Order, October 1994. Jean Guitton was an intimate friend of Pope Paul VI. Paul VI had 116 of his books and had made marginal study notes in 17 of these. This latter is a fair evaluation when one considers the changes implemented, the results achieved, and the tendency of modern theology, even papal theology (cf. question 7). Who made up the Novus Ordo Missae? 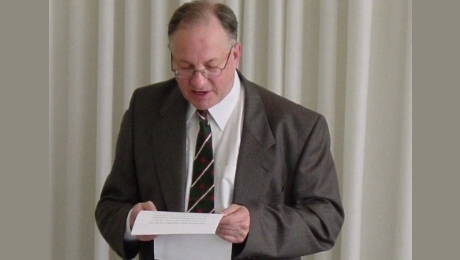 It is the invention of a liturgical commission, the Consilium, whose guiding light was Fr. Annibale Bugnini (made an archbishop in 1972 for his services), and which also included six Protestant experts. Fr. Bugnini (principal author of Vatican II’s Sacrosanctum Concilium) had his own ideas on popular involvement in the liturgy (La Riforma Liturgia, A. Bugnini, Centro Liturgico Vincenziano, 1983), while the Protestant advisors had their own heretical ideas on the essence of the Mass. However, the one on whose authority the Novus Ordo Missae was enforced was Pope Paul VI, who “promulgated” it by his apostolic constitution, Missale Romanum (April 3, 1969). However, his proscription was highly unclear. In the original version of Missale Romanum, signed by Pope Paul VI, no mention was made either of anyone’s being obliged to use the Novus Ordo Missae or when such an obligation might begin. Translators of the constitution mistranslated cogere et efficere (i.e., to sum up and draw a conclusion) as to give force of law. The version in the Acta Apostolicae Sedis (which records all official texts of the papacy) has an added paragraph “enjoining” the new missal, but it is in the wrong tense, the past, and reads praescripsimus (i.e., which we have ordered) thereby referring to a past obligation, and nothing, moreover, in Missale Romanum prescribes, but at most permits the use of the “New Rite" (The Angelus, March 1997, p. 35). Can it be true that Pope Paul VI wanted this missal but that it was not properly imposed (it is known moreover, that Pope Paul VI signed the Institutio Generalis without reading it and without ensuring that it had been previously confirmed by the Holy Office). *A Novus Ordo Missae celebrated according to the 1969 typical edition would look very similar to the traditional Roman Rite, with the celebrant saying most (if not all) the prayers in Latin, facing the tabernacle and wearing the traditional Mass vestments, with a male altar server, and Gregorian chant, etc. None of the current abuses, e.g., Communion in the hand, Eucharistic Ministers, liturgical dancing, guitar-masses, etc., have part with this official form. Hence, the aforementioned cardinals' (as well as the SSPX's) critique of the Novus Ordo Missae is not of its abuses or misapplication, but rather of its essential and official form. The dissimulation of Catholic elements and the pandering to Protestants which are evident in the Novus Ordo Missae render it a danger to our faith, and, as such, evil, given that it lacks the good which the sacred rite of Mass ought to have. The Church was promised the Novus Ordo Missae would renew Catholic fervor, inspire the young, draw back the lapsed and attract non-Catholics. Who today can pretend that these things are its fruits? Together with the Novus Ordo Missae did there not instead come a dramatic decline in Mass attendance and vocations, an “identity crisis” among priests, a slowing in the rate of conversions, and an acceleration of apostasies? So, from the point of view of its fruits, the Novus Ordo Missae does not seem to be a rite conducive to the flourishing of the Church’s mission. Does it follow from the apparent promulgation by the popes that the Novus Ordo Missae is truly Catholic? ...the rite and its related rubric are not in themselves a dogmatic definition. They are capable of various theological qualifications, depending on the liturgical context to which they relate. They are gestures and terms relating to a lived and living religious action which involves the ineffable mystery of God's presence; it is an action that is not always carried out in the exact same form, an action that only theological analysis can examine and express in doctrinal formulas that are logically satisfying." It should be also be understood that the papal bull, Quo Primum is neither an infallible document, but rather only a disciplinary document regarding the liturgical law that governs the Tridentine Rite. Is the Novus Ordo Missae invalid? However, the celebrant must intend to do what the Church does. The Novus Ordo Missae will no longer in and of itself guarantee that the celebrant has this intention. That will depend on his personal faith (generally unknown to those assisting). Therefore, these Masses can be of doubtful validity. The words of consecration, especially of the wine, have been tampered with. Has the “substance of the sacrament” (cf. Pope Pius XII quoted in principle 5) been respected? While we should assume that despite this change the consecration is still valid, nevertheless this does add to the doubt. Are we obliged in conscience to attend the Novus Ordo Missae? If the Novus Ordo Missae is not truly Catholic, then it cannot oblige for one’s Sunday obligation. Many Catholics who do assist at it are unaware of its all pervasive degree of serious innovation and are exempt from guilt. However, any Catholic who is aware of its harm, does not have the right to participate. He could only then assist at it by a mere physical presence without positively taking part in it, and then and for major family reasons (weddings, funerals, etc). FAQ video sidebar: 07 What is the Novus Ordo Missae? 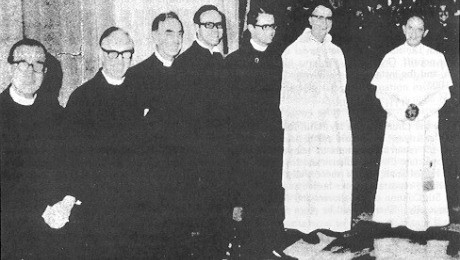 April 10, 1970: Paul VI thanks the 6 Protestant ministers who assisted with creation of New Mass.